Cymbet Corporation is the leader in solid state energy storage solutions for microelectronic systems. The company is the first to market eco-friendly, biocompatible rechargeable solid state batteries that provide electronic systems designers with new embedded power capabilities. The company’s EnerChip™ batteries enable new concepts in energy storage application for ICs and new products for medical, sensor, RFID, industrial control, communications, and portable electronic devices. Cymbet’s new single chip Power Management Real-Time Clock (PMRTC) device is a world class device and among the lowest power RTCs in the industry. Founded in 2000, Cymbet has facilities in Elk River, MN, and Lubbock, TX. Cymbet solid state batteries utilize semiconductor fabrication processes to produce a rechargeable energy storage device with no liquids, gels, or harmful chemicals. EnerChip™ devices have the unique capability to be packaged like a standard semiconductor component or as a bare die to be co-packaged with other integrated circuits. Cymbet has a broad patent portfolio covering enforceable aspects of materials, design, manufacturing, and applications. Industry transition to low power integrated circuits (ICs) requires new, low cost integrated energy storage options not met by current solutions. Battery wear-out, high integration cost, bulky size, high failure rate over life of product, and disposal issues create an opportunity for a new solution. Cymbet’s EnerChip™ is a solid state battery that is permanently rechargeable and eco-friendly, overcoming the limitations of disposable batteries for low power electronic applications. EnerChip™ devices can be co-packaged with other semiconductor integrated circuits in a single package or delivered as a surface mount technology (SMT) component. The EnerChip™ can provide a few days to a few weeks of battery backup power where non-volatility is important, or main power for wireless sensors, active tags, and medical applications. With innovations not previously available, the Cymbet EnerChip™ provides an extremely small footprint, high energy density, rechargeability, high-speed SMT assembly, and solder reflow tolerance. The single chip PMRTC device is world class, among the lowest power RTCs in the industry, is a Cymbet proprietary design, and is manufactured by a leading semiconductor wafer foundry. The PMRTC features power and battery management functions, RC and crystal operating modes, a temperature sensor, and is available in both SPI- and I2C-bus options. The PMRTC is available in a thin surface mount package and is also available in bare die format for integration with other components.EnerChip™ RTC: The surface mount package integrates RTC and power management functions with an EnerChip™ battery for backup power, providing one to five days of run time in the event of main power loss. The compact package delivers space and cost savings versus discrete solutions relying on supercapacitors or coin cell batteries. The iRTC products contain all of the RTC and power management features of the PMRTC, combined with an EnerChip™ battery that provides backup power for up to three months. The iRTC products come in a range of surface mount package sizes. Small EnerChip footprint uses less board space and is very thin. Products can be made smaller and thinner. EnerChips can be placed on either side of printed circuit board. EnerChips are delivered on tape and reel and use the standard Surface Mount Technology assembly processes. EnerChips do not require any holders or hand assembly/insertion like batteries. Because EnerChips are permanent, there is no battery access door or compartment required. This saves money in product design and increases product reliability. Users do not need access to the internal components of the product. EnerChips have a very low leakage versus Supercapacitors, with a storage life of years versus months. EnerChips are completely safe and compliant with all international requirements for Air Transport. Given EnerChips are RoHS compliant, end-of-life product disposal should be with the other RoHS devices on the board as per WEEE directives. There are no costly special disposal procedures. EnerChips are in stock and readily available at Distributors around the world. Cost saving supply chain procedures can be implemented. EnerChips are produced in two geographically diverse manufacturing sites which insures product availability and no supply chain interruptions. 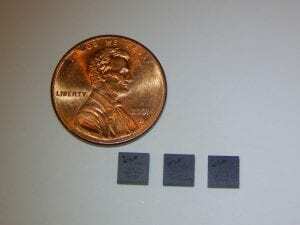 EnerChips are non-cytotoxic, making them bio-compatible. Integrated battery charging and discharge cutoff circuits, operating from a single power source. Key partnerships: Texas Instruments, Microchip, Micro Crystal, X-FAB, Cymbet Premier Development Partners, others. Direct regional sales force across North America. Global Distribution partners are highlighted on our Distributors page. Cymbet has two facilities in the USA: Elk River, MN (Minneapolis/St. Paul suburb) and Lubbock, Texas. The Elk River facility includes the company’s headquarters as well as test/failure analysis and some packaging capabilities. The Lubbock fab site is co-located with X-FAB Inc. – one of the the leading foundry groups for analog/mixed-signal semiconductor applications. With this Texas facility, Cymbet can facilitate largest volume manufacturing of solid state micro-batteries.